The economy doesn’t exist in a vacuum. 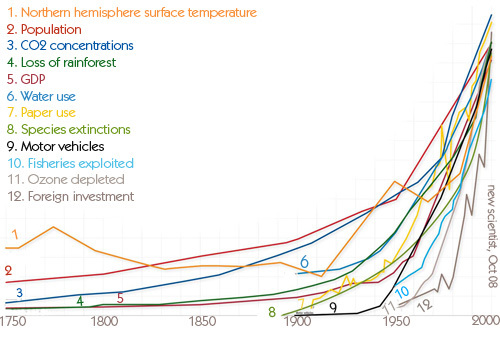 It is, in Herman Daly’s words, “a subsystem of the finite biosphere that supports it.” As the graph above shows, (more detailed version here) global GDP has not risen in isolation. Water use, deforestation, and species loss have all soared with it. The earth’s fresh water, forests, oil deposits, atmosphere and so on are very real constraints to growth. Some of them are renewable, and some of them are finite. Let’s look at each of those in turn. The Living Planet Report is a regular publication from the WWF, charting our use of the world’s resources. The chart below is from the 2008 edition. 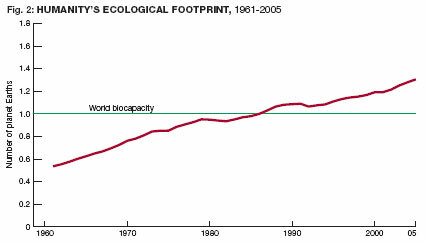 The green line shows the earth’s biocapacity – the earth’s total natural services, resources, and ability to absorb waste. The red line shows how much we’re actually drawing down. We parted company with the earth’s actual capacity in 1987, but because these are renewable resources, it is possible to overshoot. What that means is that we catch smaller fish, cut trees before they have a chance to mature, and so on. Each year that we overshoot, we weaken the earth’s ability to provide for us the following year. Essentially, we’re into an ecological overdraft. This breaks the fundamental rule of sustainability, that we must meet the needs of today without compromising the ability of future generations to meet theirs. Making this more complicated is the uncomfortable fact that ecological debt is not equally spread. The world map below shows ecological debtors and creditors. Countries in red are using more resources than are contained within their own borders, while the green ones are running a surplus. Here’s a difficult question for all of us: If developing countries want to enjoy the same lifestyles that we enjoy in the US or the UK, where will the resources come from? Who’s going to tell them they can’t have what we have? A world without Indium might not keep you awake at night, although companies making touch-screens and LCDs will want to be working on alternatives. 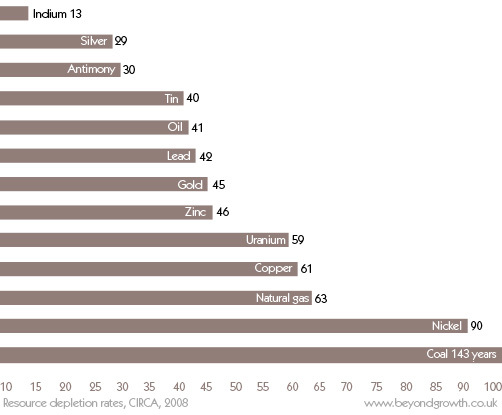 It’s not so easy to be blase about copper or tin, or the fossil fuels. Although other fuels are theoretically usable, is a new generation of nuclear power stations wise with 59 years of uranium left? “Non-renewable resources are an obstacle for positive long run growth if they are essential for production” says Jurgen Anthony of the University of Augsburg, where the figures above were compiled. As these resources head towards exhaustion, growth may not even be possible. For me everything on this website is perfectly obvious. But I am a trained Astro Physicist and Geographer, so perhaps whatever is obvious to me doesn’t really count. However – whenever I get to talk alone to an economist for ten minutes and bring up the topic of the possibility of “perpetual exponential economic growth in a finite world”, they will, at one point, acknowledge the impossibility of this mystic – or rather mysterious – belief. The Swiss economics Professor (yes) H.C. Binswanger calls economists a “Glaubensgemeinschaft”, a religious community that is. Their’s is not a science, but an artificial belief system. It became artificial and virtual in the very moment that “soil” (natural resources) was dropped out of the economic equation. From then on it looked – in theory at least – as if limitless growth were possible, while to every normal thinking person, like a farmer, it should be obvious, that this is an entirely nonsensical notion, at odds with common sense, daily experience and scientific insight. But nonetheless: all of globalized mankind now follows this nonsensical, actually insane paradigm. Just like 1000 years ago it was common in Europe to burn innocent women for allegedly having had an affair with the Satan. To most of us (I hope) that nowadays is a pointless notion, but back then most people believed that. Now people believe in perpetual exponential economic growth. There is no difference. The Economy, business, money have become symbols of a world wide religion. Wars are fought in the name of it, people are arrested in the name of it, mass murders carried out and entire landscapes, reagions, oceans, in fact the surface of the entire planet, ultimately are annihilated in the name of it. IT. What is this IT? What drived the global money machine? Greed. Lust for power. Perhaps our medieval forebearers were right, and the Devil exists after all? The soulless thing the money machine is could well be described as a greed automaton. The economy at large, viewed as an apparatus, basically consists of a black box algorithm that absorbs on thing (not to say EVERYTHING) on one side, to generate the output of precisely one and only thing on the other: Profit. Money. Ever more of it. What we have created is a greet automaton, a giant “eating machine”, of which we merely are small components, and if a component does not fit, it is thrown out. C’est ca. Yes, I think it is obvious, which suggests to me that the politicians and banks know how unsustainable it is and choose to ignore it.